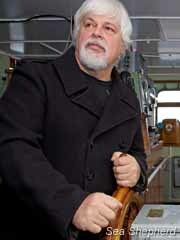 Sea Shepherd Update – 22/05/12 – Greetings From Germany by Captain Paul Watson. 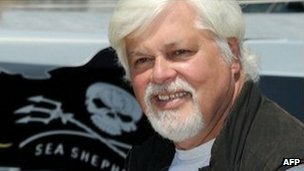 After spending 8 days in the custody of German authorities, Captain Paul Watson has been released on bail. Immediately upon being released Captain Watson and his attorney, Oliver Wallasch spoke to the media outside the Preungesheim Prison in Frankfurt, Germany. The extradition process is still set to take place. It is an unprecedented move for a non-German national to be released on bail during an extradition proceeding. The Higher Regional Court in Frankfurt confirmed together with the General Public Prosecutor that the authority to end the extradition proceedings belongs to the German Minister of Justice, Sabine Leutheusser-Schnarrenberger. I would like to thank everyone around the world for the incredible support over the last week that I spent in a Frankfurt prison. It is greatly appreciated. The people of Sea Shepherd Germany have been wonderful and I have been happy to see so much support from supporters in Costa Rica and around the world also. We have an excellent worldwide legal team working hard to resolve this legal issue. I am confident that this team will do the very best they can on every front involved with this case. Although I have no reason to believe that the Costa Rican legal system would not give me a fair trial, my concern is not for the judicial system, but for the reality that the shark fin mafia of Costa Rica has a price on my head and a Costa Rican prison would provide an excellent opportunity for someone to exercise this lethal contract against me. 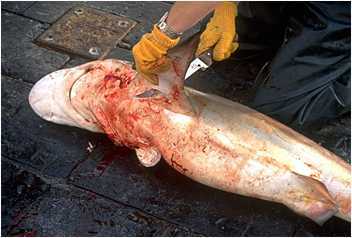 We have cost the shark finners a great deal of money over the last two decades and they want their revenge. I would need absolute assurance that the Costa Rican authorities would not place me in the position to jeopardize my safety when I return to Costa Rica to prove my innocence in court. There are two very important points that I would like to make. The first is that although my arrest and detention have been a focus of this incredible support the fact is that this is not about me. It is about our oceans and the ever-escalating threat of diminishment of the diversity of life in our seas. 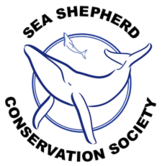 It is about the sharks, the whales, the seals, the sea turtles and the fish. This is an opportunity to shine an international spotlight on what is happening to the sharks and especially to illustrate that there are elements in Costa Rica responsible for a great deal of the illegal trafficking in shark fins. Secondly, I want to make it very clear that whatever happens to me will not affect our campaigns. I have delegated the responsibility of commanding our ships to my very capable captains and they will be defending sharks this summer in the South Pacific and the whales in the Southern Ocean Whale Sanctuary. The Cove Guardians will return to Taiji, Japan in September to defend the dolphins. 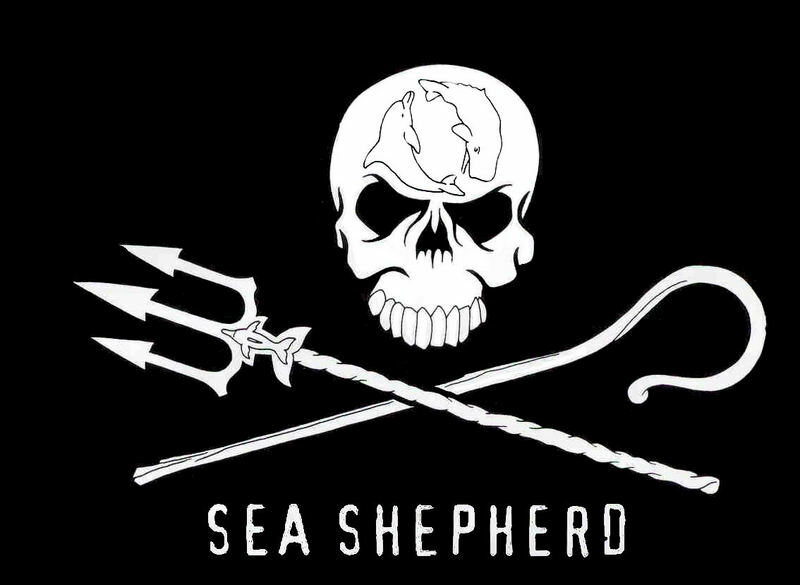 Fortunately, Sea Shepherd is now much bigger than myself and even more fortunately; the reality is that we now have a legion of passionate, dedicated, courageous and resourceful volunteers around the world. If I am prevented from serving on the front lines upon the high seas I will serve as a symbol of resistance to the destruction of our oceans from inside a prison cell. Power and greed do not surrender easily and history has shown that sometimes prison is an ordeal that must be endured in order to shake the foundations of powerful special interests. There is no shame in incarceration as Mandela, Gandhi, Thoreau, Aung San Suu Kyi, and so many others have demonstrated. Power does not relinquish easy and the powers opposing our efforts are immense like the shark finning, bluefin tuna fishing, whaling and dolphin killing industries, and the governments that support this trade in death like Japan, Costa Rica, Norway, Iceland, Malta, Canada etc. Sometimes I’m surprised we have made any progress at all but progress we have made indeed, and we will continue to win victories for our clients in the sea, no matter what the obstacles thrown in our path because Sea Shepherd is not just me, it is now an international movement and our flag is becoming widely known and more and more respected and most importantly, our permanent and most proud legacy are the thousands of whales, tens of thousands of sharks, hundreds of thousands of seals and millions of fish that swim free in the sea now, that would otherwise have been cruelly slain if not for our intervention. In the end it is about them and not about us. We invest our passion and in return we reap the ever-enduring seeds of life. – then the body is thrown back in the water as ‘wastage’ – to die a terrible death. 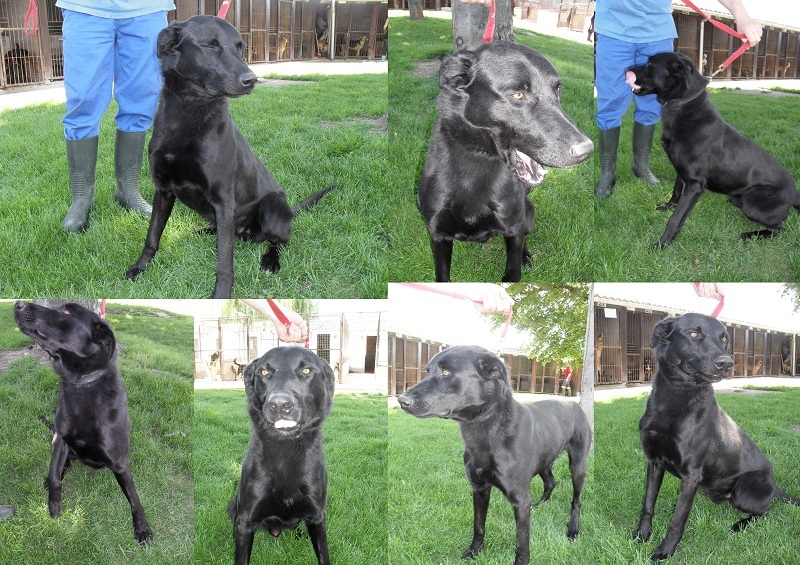 France: ‘Disney’ – He will be euthanasied on the 22nd of May if not adopted – Can You Help ? – Please Crosspost. Übersetzt: Big Notfall für Disney, männlich Labi der 3 Jahre alt. Er wird am 22. Mai euthanasieren werden, wenn keine Lösung für ihn. Es ist der Grund, warum wollen sie ihn töten. Bitte nicht geschehen lassen! …………………………… Kontakt und mehr Infos am Ende des Mails…..
Big emergency for Disney, male labi of 3 years old. He will be euthanasied on the 22nd of May if no solution for him. It is the reason why, they want to kill him. Please, do not let this happen!!! Do You Want To Make History ? An excellent video from the Vegan Society. Serbia: Latest From ‘Felix’ Cat Shelter / Sanctuary – Photos, Info and Appeal to Help With New Building Updates Due to Terrible Winter – Can You Help Please ? My name is Danica Mirkovic, I’m the president of Felinologic Association Felix and the owner of Cat Shelter Felix (it’s more of a sanctuary) in Serbia. 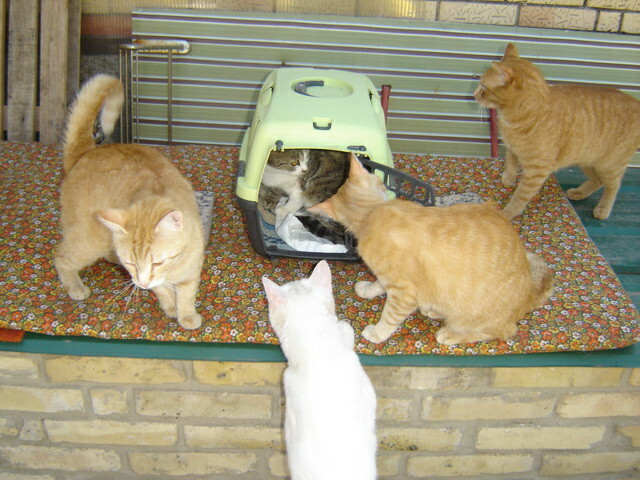 Felinologic Association Felix is an association of cat lovers, founded by my associates and me in Novi Sad, Serbia, a few years ago. It is registered as a nonprofit organization in Serbian Business Registers Agency, ID number: 08841187, Tax Identification Number: 103793133. 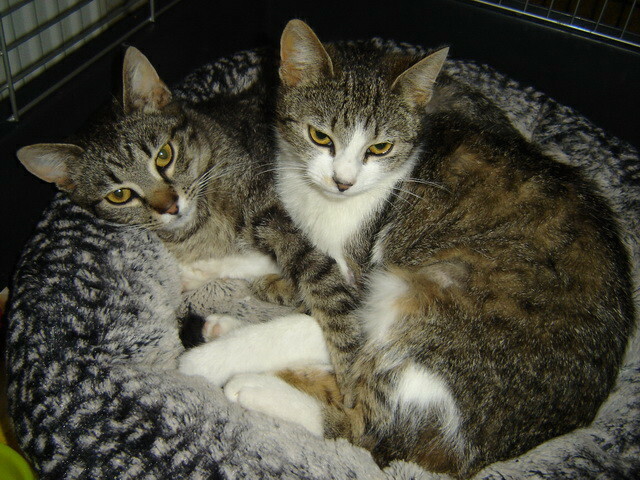 We were taking care of stray cats, trying to make their life on the street easier, but our protégés were endangered all the time. 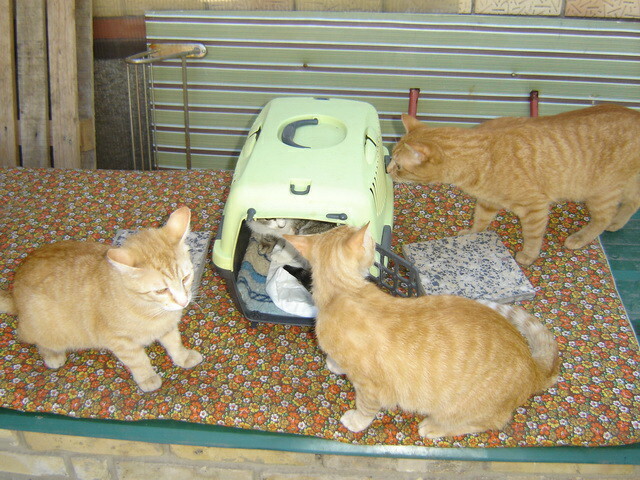 I have always thought that building of a shelter would mean safety for those (and other) cats so it finally took place in 2010. My shelter is registered as a shelter of Felinologic Association Felix in Ministry of Agriculture, Trade, Forestry and Water Management, Department of Veterinary Medicine. 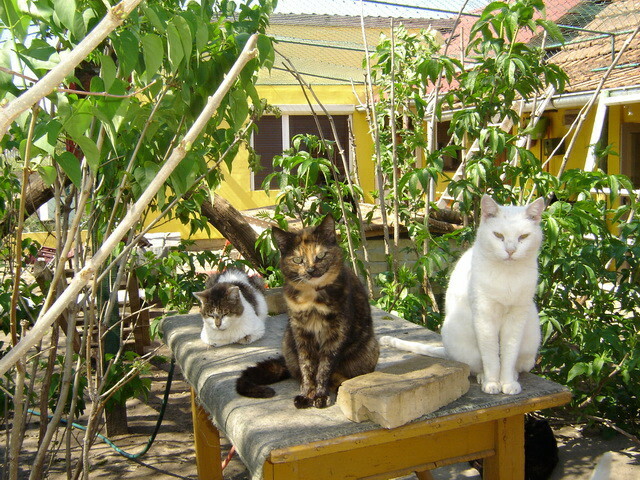 Cat Shelter Felix is located in a small village in Vojvodina, Serbia. 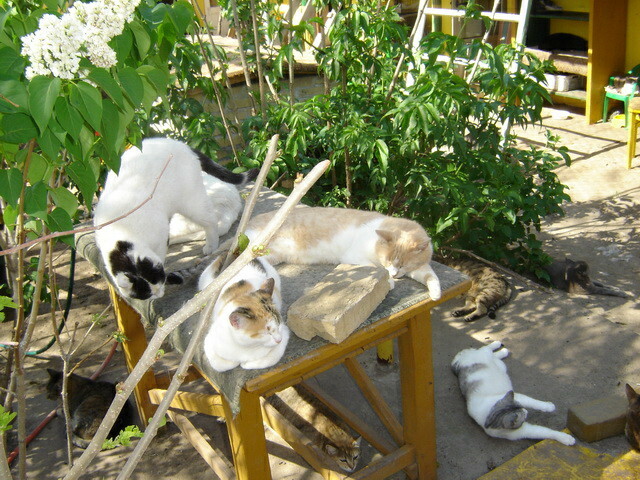 I have more than 100 cats in my shelter right now, all of them ex – strays. 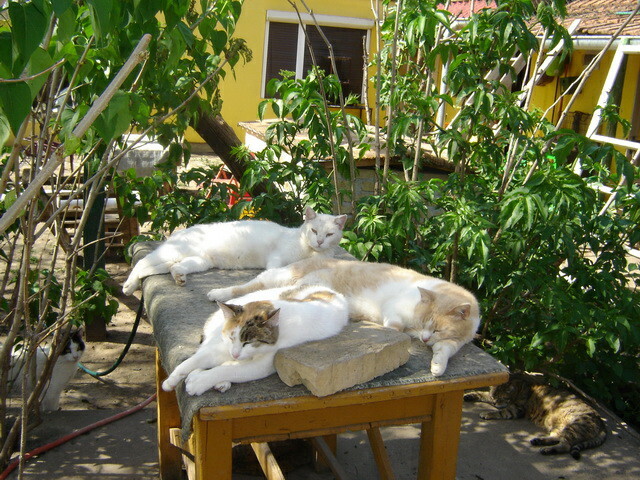 They are all neutered and spayed, vaccinated and checked by the vet on the regular basis and although some of them are very old or chronically ill it seems that they enjoy their life here. 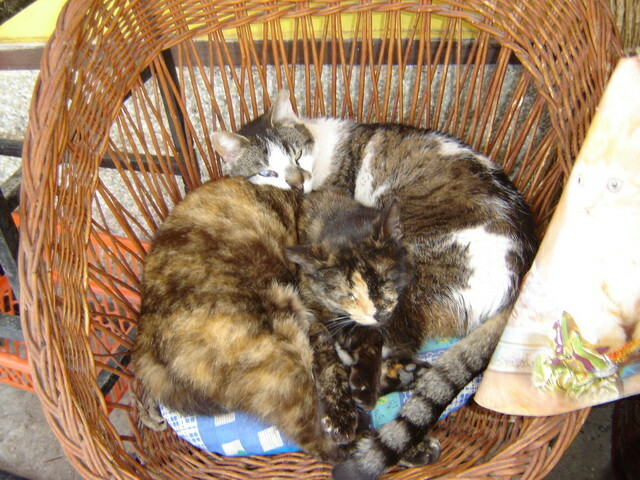 In spite of the fact that my shelter is rather crowded, I can never turn my back on a cat in desperate situation, therefore they keep arriving every now and then. 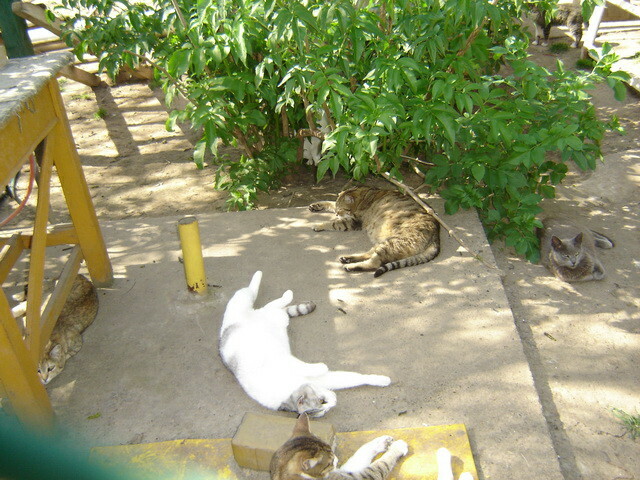 As the number of cats grows bigger, my expenses rise and it becomes harder and harder to defray them all, but the sight of happy kitties that are playing and running and resting completely relaxed, probably for the first time in their lives, makes all the efforts worthwhile. 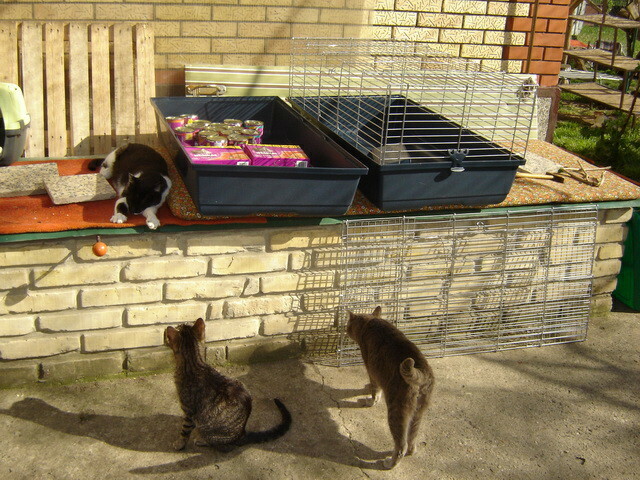 The situation in Cat Shelter Felix is very dire indeed as the shelter has been damaged by unusually harsh winter. Workers are supposed to start repairing a roof and making a concrete backyard in April and it will cost about 8,500 euros. 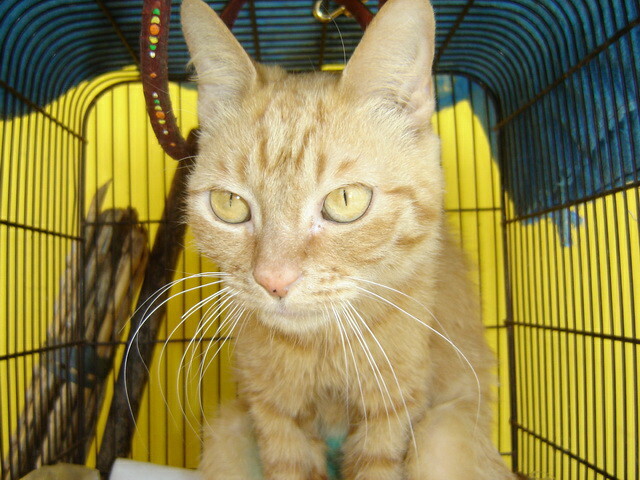 My shelter depends of donations entirely and every kind of help is needed, welcome and greatly appreciated. 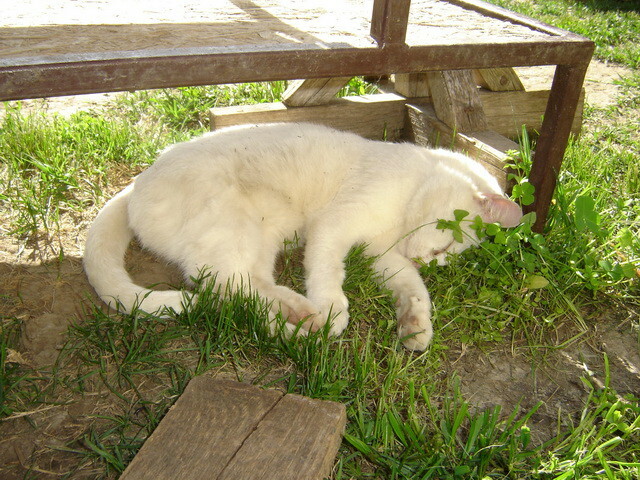 Here (above and below) are some very recent pictures that Danica has sent to us of all the cats at the shelter enjoying the better weather now. Please put word out to all your contacts – everywhere ! 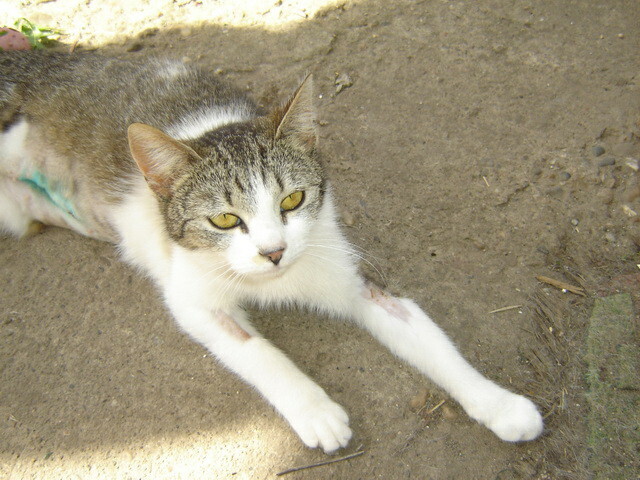 We need to get the money in to help Danica and the cats complete all the work that is needed this summer. Whatever you can give in the way of a donation, not matter how small or large, please do it. This is very much appreciated. Thank you very much in advance for any donation you may be able to provide. Please crosspost this information to all your national and international contacts. In broad daylight today, as reported in the Italian newspaper Giornale di Brescia, Italian activists conducted a bold and daring raid of Green Hill, one of Europe’s largest breeder of beagles for vivisection labs, and rescued at least thirty beagles destined for painful procedures inside laboratories and eventual death from either the fatal results of experiments or the slaughter afterwards when they are deemed no longer useful. At least 1000 activists organized by Occupy Green Hill who came from all over northern Italy started their procession in Montichiari, a city about 60 miles east of Milan where Green Hill is located. Many of them wore signs saying “We are the 86%,” referring to the percentage of Italians polled who were opposed to animal-based experimentation. On their approach close to Green Hill they were met by police and roadblocks. Groups of activists then cut through the fields and across other streets to the fences surrounding the facility. There, about 300-400 demonstrators tried to open gates in the perimeter as teams of mobile riot police and police who were deployed tried to contain them. On the side of the gates, however, the protesters opened a breach in the fence and broke into the farm, with others simply scaling the fence, carefully avoiding the barbed-wire. Once inside they scrambled into the sheds and rescued at least thirty dogs, many of them being handed over the fence to waiting hands on the other side. At the end of the day, it was reported that police had arrested 13 people. Some protesters said they had suffered violence by some officials. 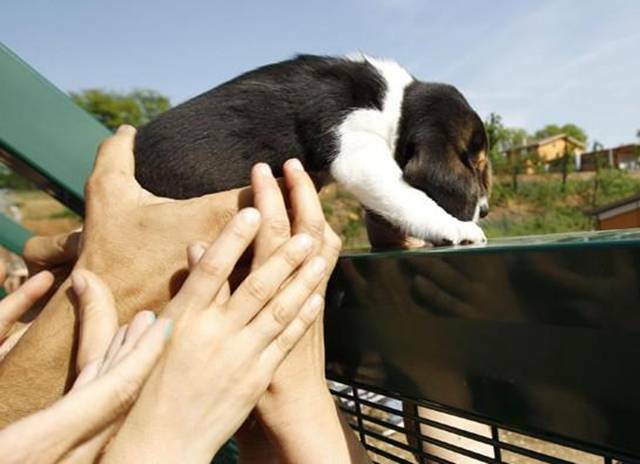 Within Europe, Green Hill is now the largest breeder of dogs destined for laboratories. Green Hill houses 5 sheds which imprisons 2500 adult dogs, plus several litters. The sheds are closed, aseptic, without open spaces and without natural light or air. Rows and rows of cages with artificial lighting and ventilation system are the environment in which these dogs grow before being loaded onto a truck and shipped to laboratories where abuse and pain await them. Among the clients of Green Hill are university laboratories, pharmaceutical companies and renowned trial centers as the notorious Huntingdon Life Sciences in England. Who profits from Green Hill? Several years ago Marshall Farms Inc., an American firm, acquired the company. Marshall is infamous throughout the world as the largest “producer” of dogs for the vivisection industry. The Marshall beagle is actually a standard variety. For about €450-900 ($600-1200) you can buy dogs of any age. For those who are willing to pay more one can also obtain a pregnant mother. Green Hill and Marshall also offer its customers on-demand surgical treatments, such as the cutting or removal of vocal cords so “researchers” cannot hear their cries of pain. Marshall’s dogs are shipped by air all over the world, but with the purchase of Green Hill as the European headquarters and the construction of a huge farm in China, Marshall is pursuing a plan of expansion and market monopoly. To Green Hill and Marshall Farm, animals are merely merchandise, commodities to just breed and sell without any thought to the pain and suffering — both mental and physical — that they will suffer. Through the work of these activists, a few lives were saved from the horrors of industry, and shows to those who profit from the lives of innocent beings that oppression will not be tolerated. Green Hill Farm in Italy may not be the beautiful location it sounds — according to Diana Donadei it is a prison to 2500 beagle dogs. She says the beagles are kept in rows of cages with artificial lighting and poor ventilation, only to be released to vivisection labs where they’re experimented on while still alive. Diana was horrified after hearing about the beagles’ plight so started a campaign on Change.org calling for the immediate closure of the facility. Click here to join Diana’s campaign and send a clear message to the Italian government that they must take action to stop the breeding of beagles for vivisection. Laura, an animal lover from London, is one of 30,000 people to have already joined the campaign and she will be delivering the petition on Wednesday to the Italian embassy on Diana’s behalf. Will you help Laura and Diana to reach 50,000 signatures before Wednesday and increase the pressure on the Italian Government to close Green Hill Farm? Diana and Laura know that the Italian Government care deeply about their reputation in other European countries and that they will close Green Hill Farm if there’s an international outcry, so they’re asking people across Europe to join their campaign and speak out to save the beagles. Click here to help Diana and Laura save the beagles now.